Theresa's Mixed Nuts: Celebrate National Doughnut Day with Fried Cake Doughnuts Topped with Chocolate Ganache Icing! 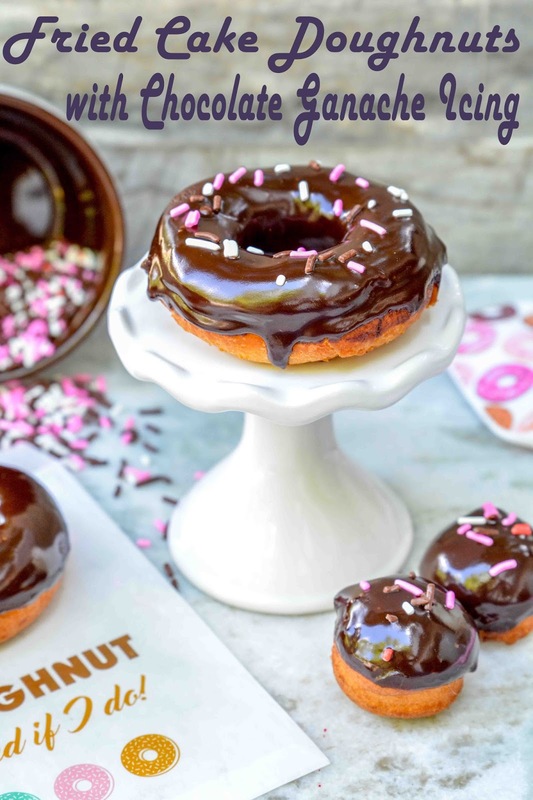 Celebrate National Doughnut Day with Fried Cake Doughnuts Topped with Chocolate Ganache Icing! Me to Mariah: Do you know what Friday is? Mariah: Yes. It's my birthday. Me: Wrong! It's National Doughnut Day! In all seriousness, Friday is Mariah's 18th birthday and since she's my firstborn baby, I have a lot of mixed feelings about the approaching day. On one hand, I'm a little sad that I'll soon be letting go of my little girl and will be sending her off on her own to conquer the world. But, on the flip side, I am super excited to look back over the past 18 years and reflect on what an amazing young woman she has become. I truly couldn't have asked for a better kid, and I'm going to give myself a big pat on the back for raising that girl up right. And to celebrate for a job well done (and to honor National Doughnut Day, of course), I'm treating the family to some homemade Fried Cake Doughnuts topped with Chocolate Ganache Icing. If there's one thing that puts a smile on Mariah's face, it's a box of doughnuts. I won't tell you how disgusted she was when I filled a doughnut box full of fruits and veggies and placed it on the counter for an April Fool's prank. The girl loves her doughnuts. In a medium bowl, beat shortening until creamy. Gradually add sugar, beating until well blended. Add in eggs, 1 at a time, beating until just blended after each addition. In a medium bowl, combine the flour, baking soda, salt, cinnamon, and nutmeg. On low mixer speed, gradually beat into the shortening mixture, alternating with the buttermilk and ending with the flour mixture. Cover dough and chill for 1 hour. Divide dough in half. Working with one section at a time, roll dough into a 1/2 inch thickness onto a well floured surface. Using a floured doughnut cutter, cut out 12 doughnuts, rerolling dough as necessary, and place cut doughnuts onto a floured baking sheet. In a pan suitable for frying, pour oil to 3½ inches in depth. Heat to 375 degrees. Fry doughnuts 4 at a time about 30 seconds on each side, or until they start to turn golden brown. Drain on baking sheet covered with paper towels. Allow to cool, then dip in chocolate ganache. Pour the chocolate chips in a glass or metal bowl. In a heavy bottom sauce pan, heat the heavy whipping cream until just boiling. Remove from heat and pour over the chocolate chips. Let sit for 1 minute, then stir until all chips are melted and mixture is smooth and lump free. 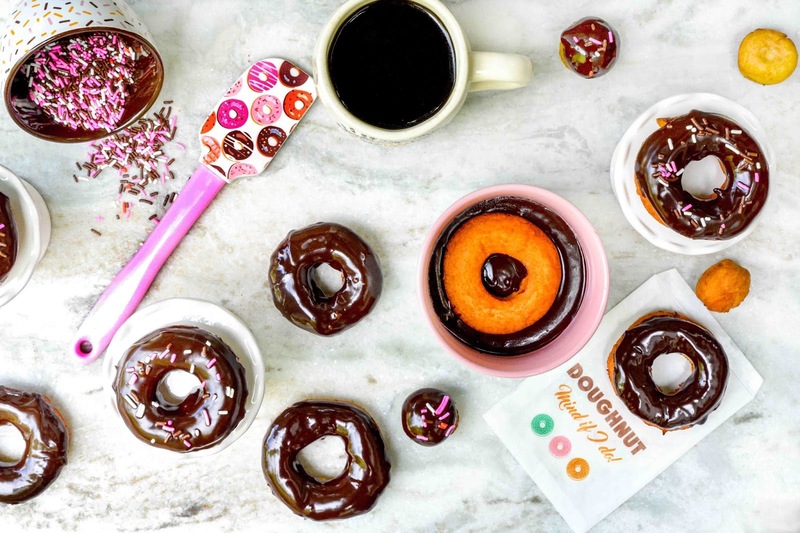 Now, what's a morning doughnut without a cup of coffee? According to Mariah, coffee and doughnuts make the world go round. 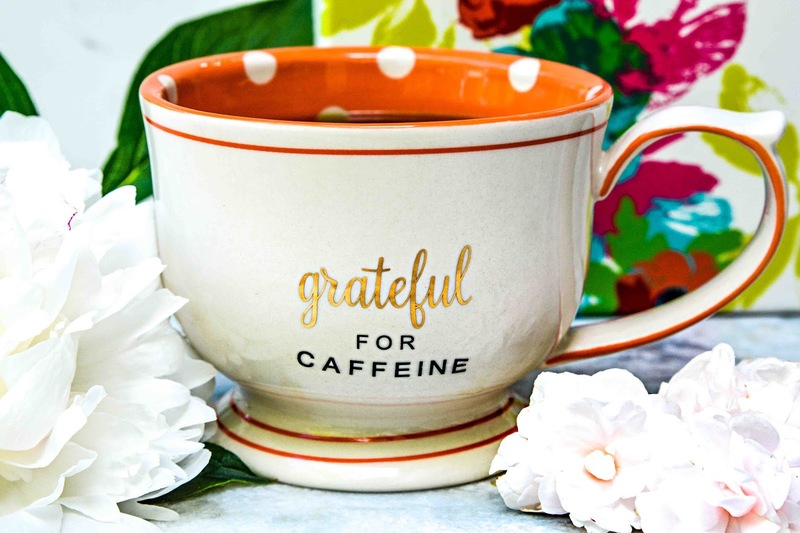 Of course, one always needs a cute mug to sip their morning cup of joe out of, and you all already know we are obsessed with the mugs from Papyrus. 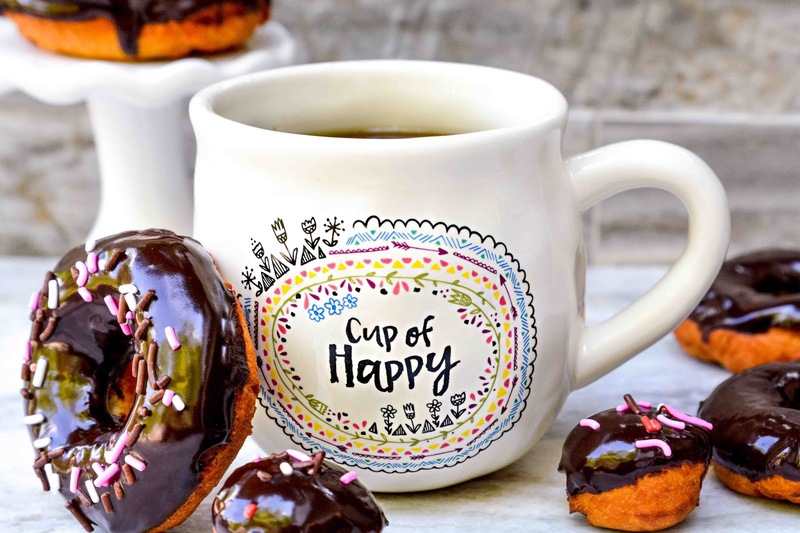 This Cup of Happy Mug filled with coffee and accompanied with a side of doughnut is all my girl needs to get the day started on a positive note. How can one be down with such a cute and colorful vintage style mug and a sprinkle topped doughnut? Papyrus has so many adorable mugs, perfect for gifting for birthdays and graduation (which we'll be doing next week!) 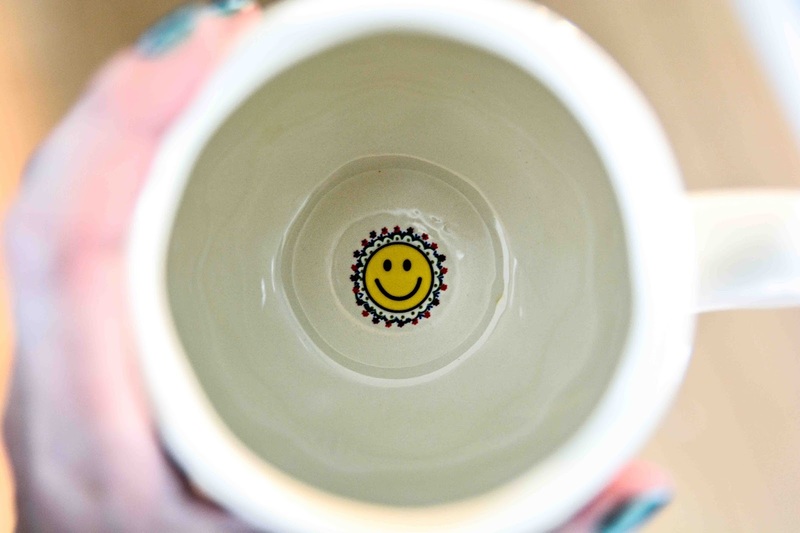 Another one of my favorites is this Grateful For Caffeine Mug. The gold foil lettering is classy and vibrant orange polka dot interior gives the mug a touch of whimsy. Perfect for your morning cup of coffee or afternoon tea out in the garden. Papyrus has a handful of other equally beautiful mugs you're sure to love. Be sure to head over and find your next favorite soon! What flavor doughnut will you be eating on National Doughnut Day? Happy Birthday to Mariah! Wishing her all the best at the end of high school and then at college! Our seniors are currently having prom balls too, they usually first parade in their evening outfits through the main street before heading to their venues. Our leading ice cream company just started making doughnut popsickle ice cream! Yours look gorgeous! 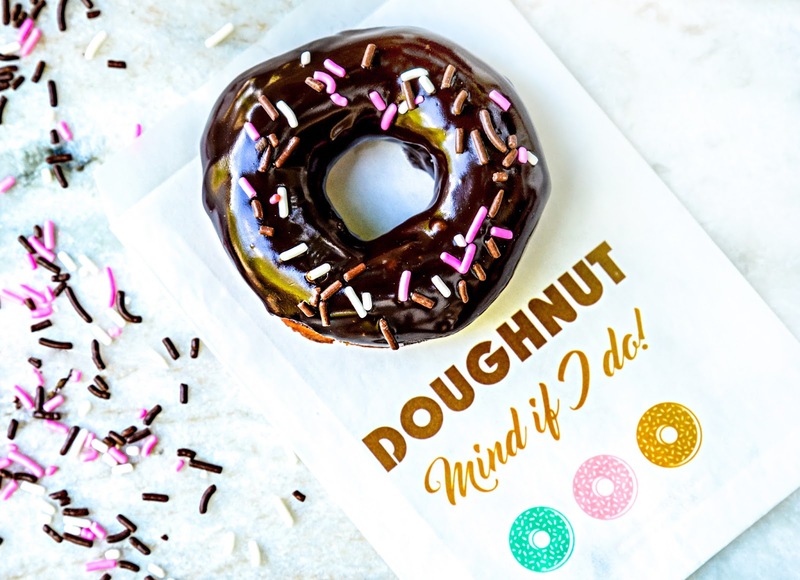 How come you have a pedestal small enough for a doughnut :) The chocolate glaze looks glamorously shiny! I think that is lovely that they get to show off their gowns to the town. What a nice way to make them feel a little more special before the big dance! We were going to take her on a trip for graduation, but she never told us where she wanted to go. So, we just decided we'll give her cash. Not very original, but she is soooo hard to buy for because there's just nothing that she wants material wise. hahaha should stick some fruits and veggies in again. Whoops, wrong box. Here's the real one. Eater eggs? Whoops. here you go, Halloween candy? Whoops. Hope she has a happy birthday and gets plenty of doughnuts before out into the world she has to stray. Adult life and bills, yuck. Oh, you are so wicked, but hiding veggies in Eggs and Halloween buckets would be hilarious! Holey God! For real, this is like God in a sweet bread treat with a hole in the center. I must make these. Oh my goodness how did I not know about national doughnut day! These look like some of the most delicious doughnuts ever I must try making them! You had me at National Donut Day! I absolutely love that mug with the gold lettering. Would make a great gift! You had me at doughnut. I love the idea of celebrating doughnut day, had no idea it existed! You definitely deserve a HUUUUGEEEEE pat on your back for raising such a beautiful and strong woman :) Happy birthday Mariah! I love this article's scrumptious pictures! This is such a good day...yum yum. Oh my goodness! I am in love with these coffee mugs and of course your amazing ganache donuts. Those things look absolutely incredible and I seriously feel like I gained 5 pounds just reading the post (but hey, it was totally worth it!) YUM! Happy Doughnut Day! I need to try all these doughnuts!! Yummy! This looks so good! I am craving for donuts because of the pictures that you shared! I didn't know that we have a national doughnut day! I would have prepared a whole party! LOL. Doughnuts is the definition of love. I am loving this recipe so much! I would love to make it as soon as I can. I can't believe I did not know about this day. That mug is adorable!!! We love donuts in our home! Happy National Donut Day today! These look delicious! I love this frosting! It looks great and has to be tasty as well. My favorite donut in the whole world! There is something about the sponge of the cake donut and the chocolate on top. So good! I had to laugh when I read about your April Fool's prank! I can just imagine the look your daughter gave you. Haha. I love your donut recipe. It looks so good! Another one of my favorite donuts are chocolate glazed sprinkled with slivered almonds. Yummy. I missed National Donut Day. WTHeck is wrong with me?! This looks so good. I wish I knew about Doughnut day so that I could have prepared something for this sweet day. This is recipe is perfect to cure your sweet tooth. I'd love to serve this during family nights and gatherings. Those doughnuts look oh-so-good! Happy belated birthday to your daughter.